Steaming pavements, hoses, and wild cries. Tree Frogs burp, exciting the dark. When we lie in light long after bedtime. Lie still in an August night? Or did we dream the first time? If you survived the Full Moon weekend and its extreme planetary hits, plus family Passover, or Easter, Bravo! You can now celebrate EARTH DAY. Take time to honor her elegance, and class, her bravery in the face of destruction. Be her great hope for redemption. The Full Moon, at the tipping point of 29 degrees pushed all into new territory. It is mostly unknown, therefore mostly uncomfortable. As we begin new journeys. We are helped by two personal planets in Aires that inspire and offer courage: Mercury and Venus working with the warrior-fire, commit us to being committed. The Sun conjuncts Uranus….a big kickstarter of unexpected beginnings, endings, chaos and freedom. This is hand in hand energy to the 29 degree Full Moon, and Mercury, Venus in Aires…. You have no option but change! Pluto, the deep, passionate, destructive, redemptive purging power-player of the Universe, is stationing to turn Retrograde, a vibration of transformation. We all shake, rattle and roll under this Plutonian roll-call. The story we share at this time is one of unexpected change. It is not just enormous social and political mayhem seen round the world, but personal challenges and change are the main game in town. Some of it flows with fortune, but most of it is incredibly difficult, often shocking the very essence of our life. Uranus, as ‘great awakener,’ and representative of ‘higher mind,’ is wrapping its liberating arms around the Sun, our ego and identity, forcing us to widen our eyes and see different points of view, especially of the eco system and earth-values. 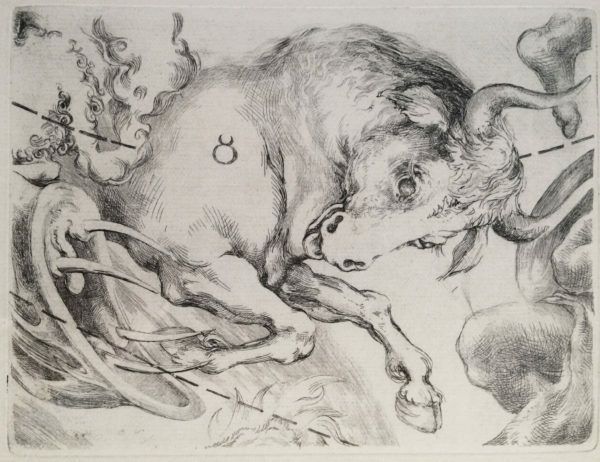 This not only affects fixed and rooted Taurus identities, who like to remain as is, but all fixed signs including Scorpio, Leo and Aquarius, who also hate being pushed, will feel Uranus’ seven year hitch through their fixed sister, Taurus. For the next seven years, Uranus will profoundly affect the earth, our ecosystem, banking, values, money and relationship, all territory of Venus ruled Taurus. (If you wish further information on Uranus in Taurus, scan past month’s blogs at dailybreathjournal.com) Adding to Venus’ influence of the moment is her ‘cheek to cheek’ with Chiron, the wounded healer. Remember that Chiron reveals and heals childhood wounds. It asks us to stop ripping open old scabs by addressing the issue, not blaming others, confronting the past, an then apply a soft dressing of forgiveness and redemption. While Chiron is in Aires, we all address issues of being enough, being seen, being valued, having the right to be alive. Speaking of redemption, with its deep, difficult emotional purging, Pluto, planet of the underworld, prepares to turn Retrograde on the 25th, at 23 Capricorn. (Saturn follows shortly after, but that’s a story for next week.) The Station of any planet brings it closer to earth, and therefore its energy is greater. As far out into the galaxy as Pluto lives, we are feeling her depth charge. Changes belong to both Uranus and Pluto. They both rip up the known to drag us screaming and kicking into the unknown. Uranus works in sudden, unexpected fashion. Pluto is slow, unrelenting, and forks up dark secrets of the past to be seen and healed. Pluto, and Saturn, passing through Capricorn are revealing secrets, lies and redacted statements of a hidden past. Capricornian interests will be highlighted in territories it favors including: big business, government, politics and patriarchy, power and its abuse, authority, and it’s lack of knowledge, even large religion and its lack of perception…. all Capricorn vessels. Next year, when we look back at this passage, we will see that the job calling us is to become our own best and highest authority. A last drop-kick to the week is Mars challenges Uranus, then Neptune. Mars and Uranus in any combo are dicey. Take extra care with sharp instruments, your anger, speed, carelessness and machinery. Mars with Neptune is likely to make us foggy, forgetful and careless, especially about commitments, and will. It might be a highly creative time? YOUR BIRTHDAY WEEK: Happiness is a gift to be cultivated. This is a good year to dig and grow joyous roots. Change is here, there, and everywhere, and this is a divine opportunity to be the change you wish to see in the world. You will not be able to stop it, with Uranus conjunct your Sun. Expect your identity and ego to be quite different by this time next year. You will not be able to hide desires, or sit on passion any longer, for deep aspects of your nature have been calling for freedom, and it has arrived! You may think that someone is doing something to you to upset your applecart, but it’s the inner guide wanting new soul-life that is now in the driver’s seat. Vroom-Vroom! YOUR PRACTICE THIS WEEK: Set an intention to balance some of the mayhem of change with practical grounding in simple breath work, and Asanas that connect you to your roots. Be calm and carry on by moving through Warrior Poses with poise and power. Do your Sun Salutations with a ritual sense of returning to known safety. Think about the poses that succor you, ask why, do those. Rise in Tadasana to your favorite balancing Pose- Dancer/Natarajasana is wonderful as it opens the heart to dance us onward! APRIL 24 Wed. 5:15 & 7 PM. Fallout wisdom is expanded, with muscle put to the service of creating a strong, calm body. Laughing Dog Yoga, Wellesley. APRIL 25 Thurs. 8:30-9:30 AM Pilates Mat, We always howl happiness at the end to be stretched, strengthened and formidable! The Studio, 1 Edson Rd., Natick. APRIL 26, Fri. 10:30-11:30 AM, Graham Technique. Learn how to really lift your bandhas, and put core strength into movement. There is nothing like an hour of Graham to wind and re-wind, release and hold- with extraordinary power. samcatcam@gmail.com The Studio, 1 Edson Rd, Natick. EYE OF THE HEART WORKSHOP –was sold out! But due to Uranian mayhem, one space has become available. 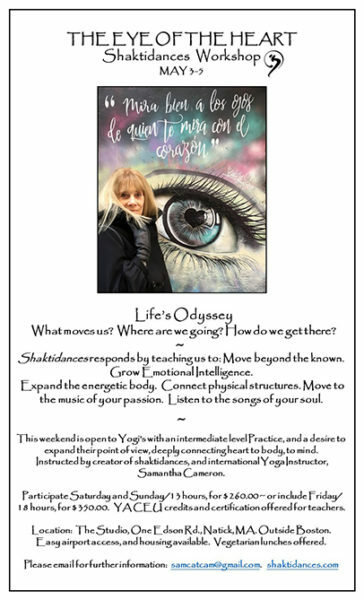 contact Samantha at samcatcam@gmail.com Saturday 4TH & Sunday,5TH, 13 CEU credits for teachers- $260.00 shaktidances.com May 4-5 THE EYE OF THE HEART is where we move as Rumi dictates. “Your heart knows the way. Run in that direction.”* Repurpose new insight through shaktidances. *Grow Emotional Intelligence woven in movement * Expand life structures synthesized by Asana & breath.